On Friday, March 22 at 7:00 PM Richard Vijgen, an Amsterdam-based programmer, presented his digital archiving project “The Deleted City” for the first time in the United States. For a preview, visit www.deletedcity.net. During the 1990s—as the Internet became mainstream—Geocities was the world’s third most visited website. It portrayed the Internet as a city and allowed millions of “netizens” to build their first digital home. In 1999, at the peak of the Dot-com era, Geocities was sold, along with its millions of inhabitants, to Yahoo! for 3.5 billion dollars. Ten years later, in 2009, as other metaphors of the Internet (such as the social network) had taken over and netizens had moved on to Myspace and Facebook, Geocities was shut down and deleted. In an heroic effort to preserve ten years of collaborative work by 35 million people, the Internet Archive, a non-profit digital library that provides permanent storage and free public access to digital materials, made a backup of the site just before it shut down. The resulting 650-gigabyte bittorrent file is the digital Pompeii that is the subject of this interactive excavation of recent online history. Contrary to popular belief, the internet does forget. Geocities was one of the first massive online communities and subsequently one of the first to perish. With the deletion of 35 million home-pages not only did we lose the texts and images they contained, but also the structure, concepts and spirit of the community that created them. With the shift in metaphors used to describe and understand the internet from the more utopian “digital city” or “global library” used in the 1990’s to the more utilitarian “social network” or “cloud” that are popular today, the homepage gave way to the profile, netizens became users and many of their aesthetic and linguistic experiments were standardised into templates. The Deleted City aims to revisit the Internet-as-a-city to evaluate how the medium, the values that underpin it and the metaphors that describe it have changed. Looking at these html files (many of them hand-coded) through a contemporary touch screen, you see the early netizens struggling with the medium, trying to find a common language and define the ever under construction homepage as we knew it. The installation is an interactive visualisation of the 650 gigabyte Geocities backup made by the Archive Team on October 27, 2009. 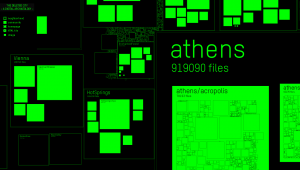 It depicts the file system as a city map, spatially arranging the different neighbourhoods and individual lots based on the number of files they contain. In full view, the map is a data visualisation showing the relative sizes of the different neighbourhoods. While zooming in, more and more detail becomes visible, eventually showing individual html pages and the images they contain. While browsing, nearby MIDI files are played.